Would You Accept A Free Trip To Colombia? I'm not going to get all sentimental on you, at least not for long. By now you know how I feel about Colombia, and Medellin in particular. Since arriving back in Virginia four weeks ago, I can't help but compare everything here to what I left behind – the climate, the geography, the people, the pace of life, the music, the nightlife, my gym. So imagine my surprise when I am contacted with an offer to go on a fully paid 2-week trip back to Colombia the day after my 33rd birthday, September 26. The purpose would be to tour the country's best sights and blog about it. Seriously? I couldn't make this kind of an offer up if I tried! And there is more I'm not quite ready to share yet as I'm awaiting the details, but let's just say if you liked my $25 Amazon.com giveaway, you'll LOVE what is coming next! This opportunity reminds me of a post I wrote back in 2007, Would You Accept A Sponsored Trip Around the World, about the Travel Channel's then new show – 1,001 Things To See Before You Die. Looking back at the comments on that post, both from myself and guys who've really blown up in the online travel world the last few years – Mike of Vagabondish, Ian MacKenzie of Brave New Traveler, and Dan at Voyagner, it is ironic to find myself actually in the situation we were debating before my RTW trip! What would I do, you ask? I'd like to think, deep down, that I would have the strength to decline the offer, in favor of doing it myself. Now, after the first RTW trip is completed, all bets are off! At this time, I can honestly say I feel completely congruent by accepting the opportunity before me. And I look forward to sharing every exciting aspect of it with you! Would you accept a sponsored trip to Colombia? Please leave a comment, retweet this post, Digg it, or hit StumbleUpon and let's get the debate going! I’d accept it if I felt I had enough space to design my own itinerary and that I could get away from any scripted bits on a very regular basis. I think any PR organization needs to be confident enough in their product to give you some leeway. Dave if my life was like yours of course I would, but once you throw kids and a full time job its hard to say yes I hope you take it thats so cool good luck. I couldn’t agree more, Krista. If you’re locked into someone else’s schedule of what you’re going to do every hour of every day, why bother going? I have a feeling Dave would never accept such an offer though. Best of luck with it, Dave! The answer is “yes, for sure”. Nevertheless, if you don’t take it, please count on me to replace you. If you take it, I will be expecting a fantastic detailed coverage about every place you and food that you try. Are you taking it or I have to start preparing my bag? Dave… I just got back from a (mostly) free trip to Colombia with four other journalists and I loved (almost) every minute of it! I only got to stay a week and I wish I would have had more time to explore Colombia’s many charms, so I’m jealous! The people who sponsored our trip did give us a lot of flexibility in what we did and tried to accommodate our various desires as best they could. We had a fair amount of time to ourselves (part of which I used to get lost in Cartagena at night). I fell in love with Medellin immediately. As the great photo at the top of the page shows, it has a spectacular setting and it’s a city working hard to overcome its violent past. I felt perfectly safe there and everywhere I went in Colombia. Can’t wait to read your posts… best wishes for a great trip! Lol, clearly we’re kindred spirits Shree. Congrats Stu – that’s awesome news! Good point Krista. Since this is my first experience with such travel, I’m probably going into it on the naive side, but I have a good feeling that it’s going to be a cool project when all is said and done. Hope you’ll continue to follow! Right – all the sides I was too tired to see when I was there earlier in the year! The tropical beaches of Parque Tayrona, islands off Cartagena, snow-capped volcanoes, and maybe even my first glimpse of the Amazon jungle! Hola Dennis – thanks for sharing your experience. I’m really excited to be part of this project, and I hope to share more details soon. I think it’s going to be a lot of fun to write about. Some opportunities, you just can’t pass up. You are living the dream, man! You only live once! As I sit in my cube and long for my next adventure, I’ll live vicariously through your tales! I too am a cube dweller and this website has been a good friend of mine the past couple of years. Is this one of those free trips to Colombia where you have to carry their bags across the border? I smell a new Locked Up Abroad show brewing. Free?!?! Just about anything FREE and I am in! Haha, congrats Dave! I will be looking for some new awesome posts about Columbia! Of course. I’d accept a free trip to Newark….and I don’t even like Newark…hahaha! Seems like yet another interesting way to experience travelling. Like it or not, it’s two weeks and you’re going to have a load of amazing stories. Congratulations on the offer and good luck with the travels. How come you decline? I’d certainly take the offer and enjoy writing about it. How many people get that opportunity! Yeah I’d still take it up. Even if it was all preplanned there is bound to be more opportunity in it than in staying at home. Thanks Erin – while it has been almost 2 years, I spent enough time in a cubicle (reading travel blogs) to know how important they can be to staying motivated and inspired. I’m glad you’re enjoying mine. It means a lot and I hope the adventures will only get bigger and better going forward! Guarran – I hadn’t heard from you in awhile but I knew I recognized that name! Glad you’ve been willing to stick with me so long. Yes, it’d definitely be a different approach to traveling, and I wouldn’t want to be close-minded about it! I’d regret the things I’ve done…. or better yet, have no regrets period. That’s definitely the right perspective. Wow, so far the “yes” responses far outweigh the “no’s.” I’ve even asked random strangers in bars….and the majority say YES. Pick me – I will go! Marlene – there was a contest which just wrapped up. All the winners have been chosen! I just stumbled across this and saw that I'm too late, as a retired, mother of 4, grandmother of 6, can you keep me as a stand in for any that have to back out at the last min. ha,ha you never know… and I'm more than ready. Hi, thanks for stopping by. Unfortunately, the best I can do is publicize any future contests I become aware of. I want to travel for my own experiences and I want to tell people about those experiences in a personal and honest way. I worry that a sponsored trip wouldn't allow me any of those things. Reading any number of other sponsored travel blogs, particularly where there are numerous sponsors, they often read like classified columns and I'm left wondering what benefit their experience gave to anyone except themselves. If you think carefully about what your sponsor represents and what they want from you it might be possible to create something worthwhile to share with the world. On the other hand it's a free trip so what the hey. It is funny that I found this post. Because I want to go to Colombia soooo badly (particularly Medellin) for at least couple months, but I couldn't afford even a trip, not even talking about place to live, transportation, food etc. And I am desperatelly looking for alternatives to get there. I was looking for scholarships, internships, but everything turned out to be hopeless. Of course I would take a trip and I would be the most excited and happy person in a whole world! Hi Deimante, thanks for stopping by and sharing your thoughts. Medellin is a beautiful city – I lived there for almost 6 months this year, and well worth the effort to visit if you can manage it. I would never turn down a free travel wherever it might takes me I am up for it! The world is too big to be stuck in one place. I agree….though I realized in following the people who did eventually go on the Colombia Trip that you might not have the same degree of freedom you are use to. It's a tradeoff I'd be willing to take! of course i'd accept it. can i have one, please? I'd definitely do the free trip. No questions there. Luckily for me (in that aspect, if not in others) I'm still single, so no one would be left behind. Sign me up! a free trip to columbia in september, would be great, but I will be there in July… Maybe next time!!! I would of started packing my bags as soon as I read the email. 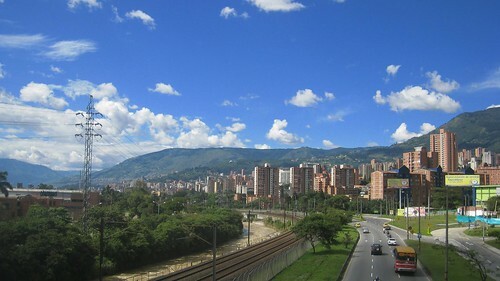 medellin has such beautiful skies on sundays and holidays, its really spectacular on these days! Without a shadow of latino doubt! a free trip? why not? i mean who shouldn’t? Columbia’s panoramic views are awesome I would definitely visit for a second time. Great what is the travel cost?? And if possible please give us some information about newjarcy. YES definitely! backpacking in South America is on the bucket list. Amanda – which South American country do you want to see most? Just completed a RTW trip which included stays in Bogota, Cartagena and Barranquilla for the Carnival in early March. Made lots of iphone notes when I had downtime at airports but never thought of blogging apart from Facebooking friends. I am a photographer so I tend to tell my stories via pictures. Hola Gerald, congrats on your big trip, though if you get the chance to come back to Colombia, be sure to give Medellin a few nights. It’s a wonderful city. You might be surprised to find that photography plays a big role in travel blogging these days. There are more than a few photography bloggers, in addition to travel bloggers who take their photography (or videomaking) seriously.